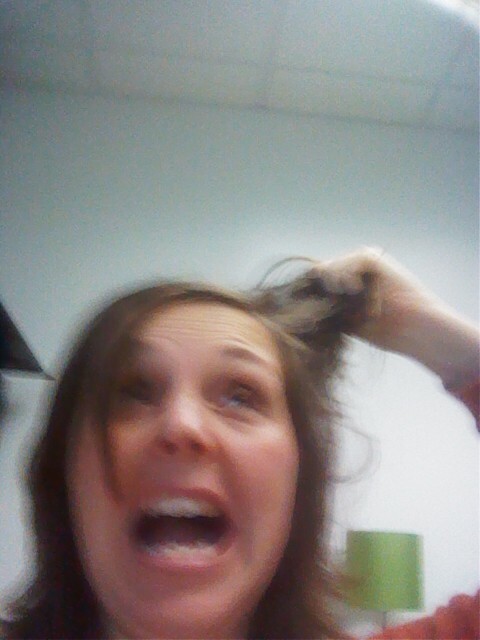 Literally pulling my hair out. I realized this morning that I am completely overbooked and as the writer of People I want to Punch in the Throat would say, I am an Over Achiever Mom (OAM). However, this OAM is just not cutting it. I have good intentions, I really do but I’m learning that I just can’t balance it all. This single mom is the Girl Scout Leader, helps with Boy Scouts when I can, is the parent administrator for the soccer team, sits on several committees for work, volunteers at school and local nonprofits, has an adorable but very demanding puppy, constantly has the kids friends over, works full-time, and wants to be the best mom ever. 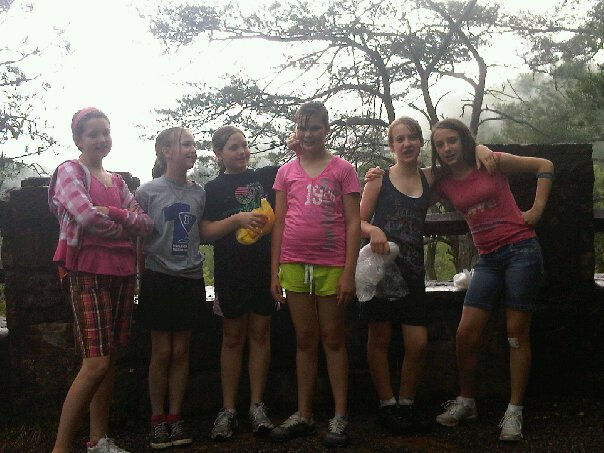 I also am responsible to take them to all orthodontist and doctor appointments, school concerts, practices, etc. And I VERY RARELY miss a game and never miss a school program. Last week, the day before Dr. Seuss’ birthday, I thought it would be a good idea to make “hat” treats for the kids’ classes. At 8 a.m. that morning, before my day really started, it did sound like an awesome idea. But by 5 p.m., when I was leaving work and still had to go to the store to get $30 worth of items, it didn’t sound so fun anymore. I came home to discover my almost 13-year-old and her friend had decided to make 2 dozen no-bake cookies. Wow! I wish they were no-mess cookies. There is a child in my son’s class with a nut-free allergy so the kitchen had to be scrubbed top to bottom before we could start making the hats (totally worth it though so that she could enjoy the treat). 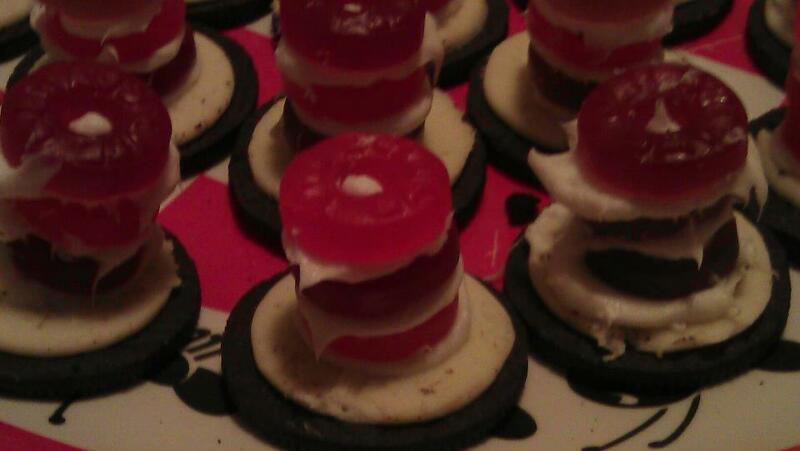 Luckily A decided to jump in and make most of the hats out of Oreos, icing and red Gummy Savers. Seventy hats later, I was ready to pack them up for school. That morning, Dr. Seuss’ birthday, I’m already in my car leaving for work when my daughter calls and says she forgot her treats at home. “Are you kidding me?” All that work and her hats are sitting in the kitchen. Of course I turn around because I can’t imagine wasting them. I run them up to school and finally head off to work. Then the weekend came. Friday night: J tells me he can’t find his black pants that are required for his Odyssey competition the next day. Rehearsal is in 30 minutes. So right before the tornadoes are supposed to hit (yes, I live in NKY), we run to Target. The cashier is dumb enough to say in front of my 10-year-old, “you better hurry, the tornado is coming and is going to destroy us.” Really buddy? Was that necessary? I rush J to school for practice, knowing that the basement at school is probably the safest place he could be if we had a tornado. I then rush home to be with my daughter and puppy during the storm. 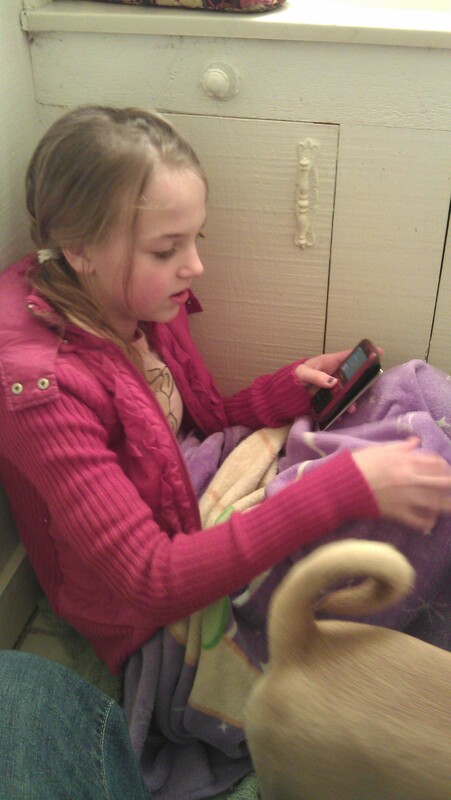 We bunker down in our half bath in the basement. The tornado doesn’t hit us but did hit nearby towns. The next hour is spent checking on friends. After cutting veggies and making dip, A and I leave to pick up J from school and then head to a family fish fry at my cousin’s home. We finally get home at 10 p.m. when a friend calls me for an emergency ride 40 minutes away… I finally get to bed at midnight. 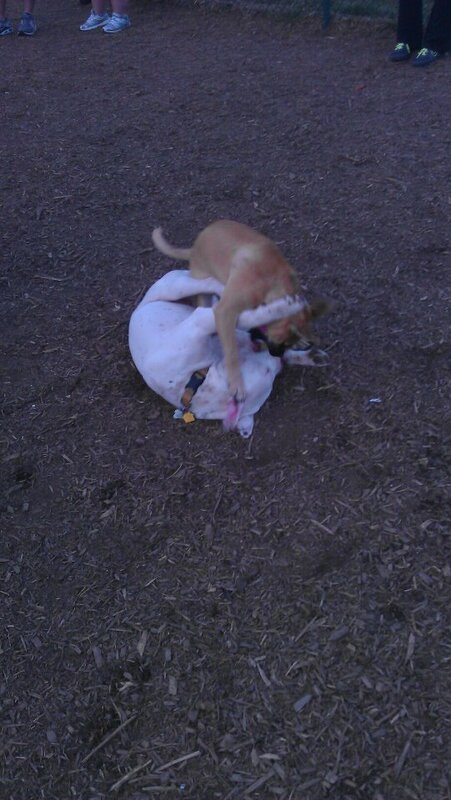 Scout playing with Buddy at the dog park. Saturday: Get my daughter out the door at 7:20 a.m. for her soccer game and leave shortly after with J for the Odyssey Competition (he took second place!). 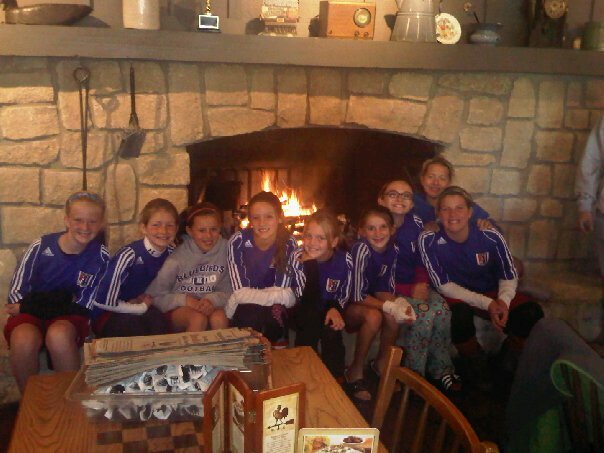 We were there until 2 p.m. After we headed to Graeters Ice cream to celebrate as a team and got home about 3:30. I then headed to the park with our puppy to let her run off some energy. I decided we were staying in the rest of the night and that we would not have friends over or go anywhere. I needed a break. Sunday: A wakes up not feeling well and has a low-grade fever. The puppy is puking. Awesome day ahead! I cleaned up the house and finally watched Judy Moody (very good). I ran to Target to buy items for a friend impacted by the tornado and the local Animal Shelter that was housing the animals until they could be reunited with their families. We then headed to my mom’s to celebrate her birthday. Monday comes and back to work. I have a lot of paperwork to do for the soccer team that I still haven’t finished, a to do list at work that is a mile long, puppy training Monday night, a school concert Tuesday night, soccer practice tonight, a very messy house and I could go on and on. So today, I am finally in my car and start to head to work when my Droid beeps. I tend to ignore this when I’m driving but luckily looked before getting on the highway. I see that I am supposed to be at my son’s school in 5 minutes to participate in gym class with him. I know he’s expecting me. CRUD! I turn around and head to school making it with about 30 seconds to spare. I call work on my way in and tell them of my delay. 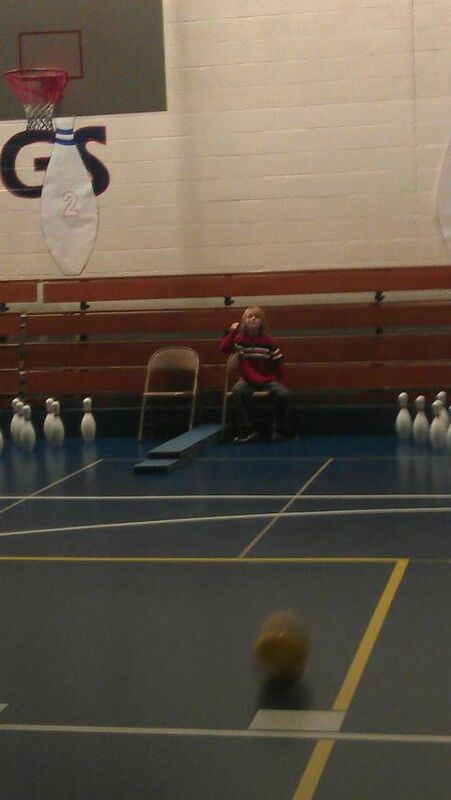 I get into gym class to bowl as the email invite said. Apparently we are doing exercise bowling. If you miss three pins the entire team has to do three star jumps. If you miss one pin, everyone has to do a crazy dance. If you miss five, you have to do five pushups. Wow, I wasn’t expecting a workout but I guess it was a good way to start the day. Then we started “CRAZY” bowling. We had a disco light and had to roll the dice to see which way you rolled the ball. I found myself having to do the old between the legs and J had to lie on his belly to throw the ball. It was a lot of fun but I almost missed it! He would have been so devastated. I almost missed it because I’m way overbooked and can’t keep things straight. I can’t imagine giving up any of it though… well maybe work but that’s not really an option. I feel like my house suffers more than anything. Notice that none of this included “me” or “dating” time, which I have completely given up on. So how do all you other parents do it? How do you stay on top of everything? How do you balance it all and not lose your mind? So we did it. The Girl Scout moms and I took our kids to Bare Escentuals for mommy/daughter makeovers. We all learned about individual skincare needs, picking the best colors for our skin tone and how to apply it properly. The consultants actually put more makeup on all of us than we would normally wear but they gave the girls a very subtle and natural look. Alexis did mine and A’s makeup. She taught A how to deal with blemishes, wash her skin properly and apply eyeliner and mascara without giving herself the “raccoon” look. Alexis did one half of Andi’s face and then had her do the other half in order to make sure she knew how to apply the makeup. She also taught her some tricks with the mirror to help apply it correctly. I even learned a few things about skin care. I was very interested in eye moisturizer and firmer since I am getting a little older. Alexis introduced to me to a good product and taught me how to apply it. She also did my makeup. I liked the Bare Minerals foundation and primer she used. The mascara seems like it won’t clump easily. The eye shadow and eye line went on easily BUT I did feel a little overdone when I left with plum, teal and beige eyelids and a dark shadowy eyeliner. My children were even a little embarrassed to go to Target with me and friends made some sort of funny but not so nice jokes about where I should be working. Everyone is just used to seeing me in very natural colors. However, the product itself seemed great. I ended purchasing quite a bit of product for A that will be considered a large part of her Christmas. It wasn’t cheap but the all of the products will last her anywhere from three months to a year. Plus, they are all natural so I shouldn’t have to worry about the makeup breaking out her skin. I also won’t have to buy her moisturizer or face wash for a long time. I did buy quite a bit for myself as well. I decided against the strawberries and cream lipstick and gloss. I just didn’t like the color but wow that lipstick stayed on through dinner, a glass of wine washing my face and even sleeping! end doing this as a mother/daughter outing or even for you and a few friends. Feel free to ask me any questions about our experience. I’d love to hear about your experiences with makeovers and other products as well!